From the Preface by Lucien Febvre: MARC BLOCH'S Caracteres originaux de l'histoire ruralefranfaise, which was originally published at Oslo in 1931 and appeared simultaneously at Paris under the imprint Belles Lettres, has long been out of print. As he told me on more than one occasion, he had every intention of bringing out another edition. In Marc Bloch's own mind this was not simply a matter of reissuing the original text. He knew, none better, that time stops for no historian, that every good piece of historical writing needs to be rewritten after twenty years: otherwise the writer has failed in his objective, failed to goad others into testing his foundations and improving on his rasher hypotheses by subjecting them to greater precision. Marc Bloch was not given time to refashion his great book as he would have wished. One wonders whether he would in fact ever have brought himself to do it. 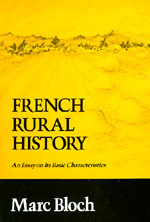 I have the impression that the prospect of this somewhat dreary and certainly difficult task (however one may try to avoid it, revision of an earlier work is always hampered by the original design, which offers few easy loopholes for escape) held less appeal than the excitement of conceiving and executing an entirely new book. However this may be, our friend has carried this secret, with so many others, to his grave. The fact remains that one of our historical classics, now more than twenty years old, is due for republication and is here presented to the reader. Marc Léopold Benjamin Bloch (July 6, 1886 – June 16, 1944) was a French historian who cofounded the highly influential Annales School of French social history.